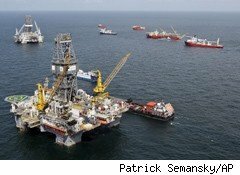 Obama administration officials are planning to temporarily ban the sale of new offshore oil drilling leases in the eastern Gulf of Mexico and off the Atlantic coast, Interior Department Secretary Ken Salazar said Wednesday during a press briefing. That decision reverses the stance the administration took in March, when it said new drilling in those two regions could move forward. Salazar attributed the policy change to the horrific BP (BP) Deepwater Horizon oil spill, which began in April and spewed nearly 5 million barrels of oil into the Gulf of Mexico. Information gleaned in the aftermath of that disaster contributed to the administration's decision to halt the sale of leases in those regions, he said. Instead, the administration will focus on existing leases that have been granted, and not expand drilling into new areas, Salazar said. Lease sales set for the western and central areas of the Gulf Coast initially were planned for March and August, but those sales will be postponed until the Interior Department has finished its safety analysis, said Salazar. He said he hopes to move forward with the sales by the end of 2011 and into 2012. "We have 29 million acres in the Gulf of Mexico that has not been leased, so there is plenty of opportunity [without tapping into the eastern Gulf or the Atlantic]," Salazar said, noting oil companies are operating on less than one third of the leases that they already hold. Meanwhile, Salazar noted, before the Department of the Interior can act on leasing drilling rights in the eastern section of the Gulf, Congress will have to lift a moratorium on offshore oil drilling in that region. Last month, the Obama administration lifted its blanket-ban on offshore oil drilling a month ahead of its planned Nov. 30 expiration.